Below are a list of commonly asked questions about Growing Good Health and Community Supported Agriculture programs. CSA stands for community supported agriculture. A CSA works like a subscription program for vegetables and fruits. You pay local farmers in advance for vegetables and fruits to be produced in the upcoming growing season. For this program, VUMC will pay the farm. By purchasing a "share" in the farm, you share in both the risk and the bounty of the harvest while helping small farmers cover the cost of production (such as seeds, equipment maintenance, and labor). Throughout the growing season, CSA members receive a portion of each harvest that includes a variety of vegetables. These baskets of fruits and vegetables are often brought by the farmers to a central location for convenient pickup by members. What comes is a CSA box? CSA boxes include a variety of in-season fruits and vegetables. For example, the spring CSA box may have a variety of salad greens, carrots, beets, radishes, broccoli and turnips. As the season moves to summer, CSA boxes may include peppers, tomatoes, eggplant and squash. Fall will bring kale, winter squash, sweet potatoes, cucumbers and mustard greens. Why should I sign up for a CSA? Participating in a CSA program gives you an opportunity to meet the hardworking, talented and intelligent people that grow healthy and delicious food. Also, CSA programs provide farmers with a stable source of income when they are preparing for the growing season. As a CSA participant, you receive food that is fresher than what can be purchased at the grocery store because it has been harvested just days before you receive it. What share sizes are available? 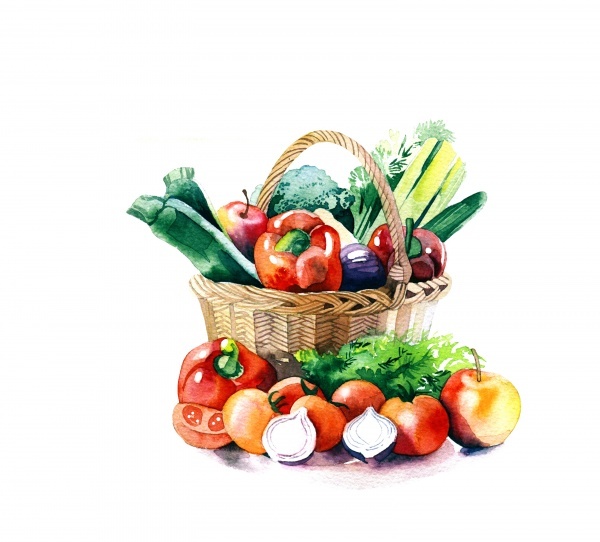 Typically, a full CSA share is a weekly delivery of a ½ bushel basket of produce, while a half CSA share is often a bi-weekly delivery of a ½ bushel basket of produce. Some CSA programs market their half CSA shares as weekly distributions or ¼ bushel baskets. What size share is right for me? If you’ve never participated in a CSA before, it is a good idea to start with a half share because some people find a weekly delivery of a ½ bushel basket of vegetables overwhelming. Depending on the farm, a half share is either a bi-weekly delivery of a ½ bushel basket of vegetables or a weekly delivery of a ¼ bushel of vegetables. A full share can typically hold about 7-10 items, and receiving this many vegetables once per week can feed a small veggie-loving family, a vegetarian couple or an individual who wants an exciting weekly challenge. What if I can’t pick up my share one week because I’m on vacation or out of town for work? Every farm and CSA program will handle this situation differently, but it is often best practice to let your CSA program know in advance you are unable to pick up your share. Most CSA programs do not offer refunds for CSA shares not picked up by participants. Every farm and CSA program will handle this situation differently. For some farms, changing your delivery day will be an easy switch, but for others it may be more difficult. Just ask your farmer! What happens if I stop working at Vanderbilt University Medical Center? If you are receiving your CSA share as part of your benefit package and stop working at VUMC, your share will be transferred to another VUMC employee who wants to receive a CSA share and you will no longer receive the CSA. What happens if I miss multiple weeks of picking up my CSA share? VUMC is excited to offer this program to our employees. Since there are a limited amount of shares available, we will monitor your participation throughout the project. At the half way mark (roughly mid-July), we will take steps to transfer CSA to another employee if a participants fails to pick up your share more than 4 times. What is the cost of the program to me? While VUMC will cover the cost of the CSA, participants are responsible for paying the tax. For VUMC employees receiving the full subsidy, this averages to $120 divided over two pay periods for the half share or $240 divided over two pay periods for the full share. Do farms offer a pickup at VUMC? This year Delvin Farms has offered to drop off pre-packaged CSA boxes to VUMC from 3:30-5:30 on Thursday afternoons. The pickup location will be 2525 West End Ave. Through this program, we have only 400 full shares or 800 half shares available for you to sign up for. There are 150 shares available for the 15% discount program. Enrollment will close once we reach those allotments. Each farm will have a limited numbers of shares as well. If you have additional questions about the program or the farms, you can contact John Compton via phone at 615.936.2686 or email at john.w.compton.1@vumc.org. Once the CSA share distribution begins, you will need to contact the farms directly for farm specific questions, such as pickup location, delivery date or vegetables provided that week or any special event the farm may host. What is Rooted Community Health? As a part of the Center for Biomedical Ethics and Society, the Rooted Community Health initiative seeks to engage the VUMC community in service to ecological sustainability, health promotion and human flourishing, and an ethically responsible understanding of our interdependency as a community within the vision of population health. Why do they want me to participate in a survey? Is it required? In support of its mission, Rooted Community Health is also encouraging participants to fill out a confidential survey before and after the CSA season. These surveys will ask questions about food and lifestyle behaviors and will help us evaluate the program. Is the survey required to receive the CSA benefit? You are not required to complete the survey; however, the information gathered from the survey would help us evaluate the program’s effectiveness. When do I have to enroll in the program? You have until April 26 to enroll in a CSA from one of the three participating farms. How do I find help selecting a farm? For help selecting a farm, review our “How to select a farm” infographic or attend our CSA Fair on March 26. Will have program representatives from 11 a.m. to 2 p.m. in the north lobby of Light Hall to answer any questions you may have about the CSA programs. In addition, you can visit our website at https://www.vumc.org/cbmes/growing-good-health, where you can find information on each farm and a link to the farm’s website.